Back in the day, to make graphics for marketing, I had to learn the entire Adobe Design Suite. There were a lot of tools, but the truth is I only needed the most simple tools for most of what I was doing in marketing – because I wasn’t a graphic artist – just a marketing creative. Today, we are blessed that the internet has spurned so many tools – and so many FREE tools! One of my favorites that I use (literally) every day is Canva. 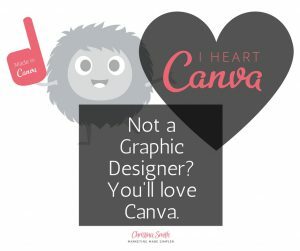 There are few things I haven’t been able to do with Canva and all for free! Yes, free! And there are templates for all of these – already in the correct size or create a custom size. It’s all below! Did I miss something or do you have a question? Email me or get detailed mentoring on the best practices with a Teach-Me-How session.